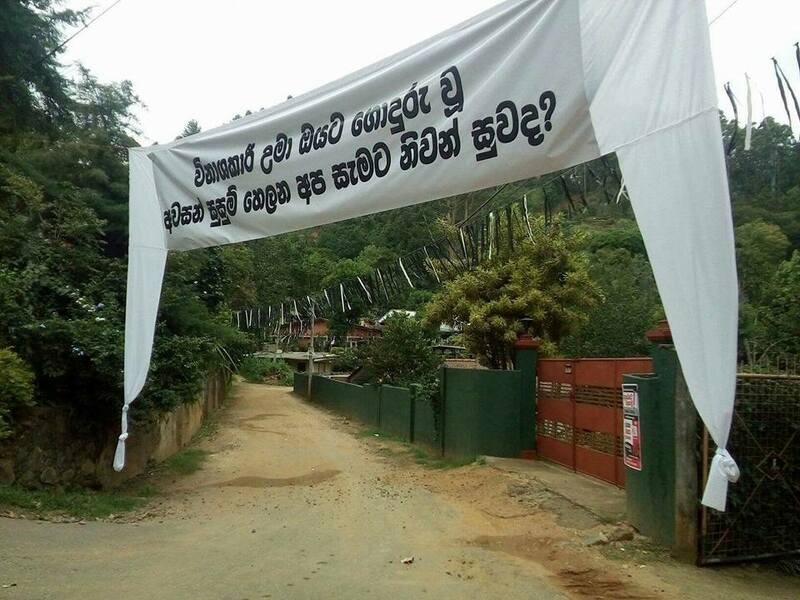 The ‘Sathyagraha’ campaign carried out by the Collective of Parents of Medical Faculty Students against SAITM, the illegal medical degree selling institute at Malabe, continuous opposite Fort Railway Station. Fort Police had obtained a Court order yesterday (29th) against putting up the temporary shed stating it was an obstacle for the public. 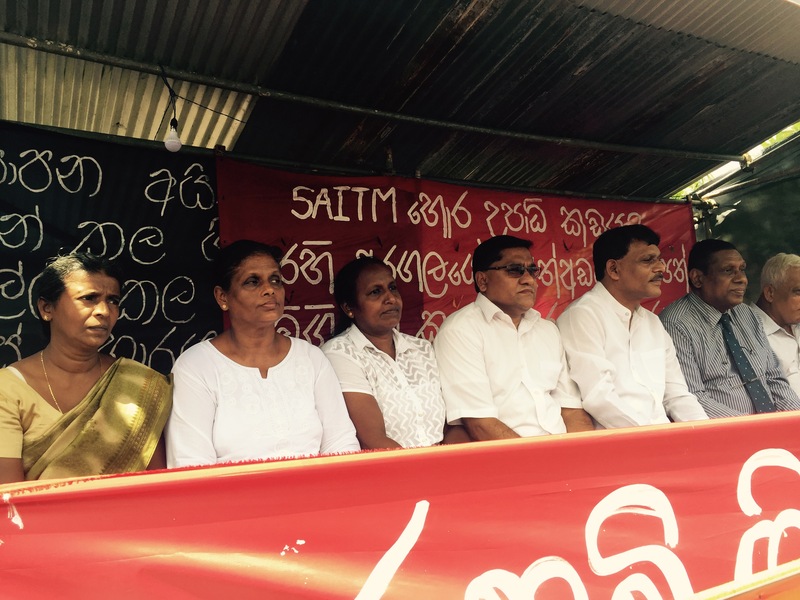 However, the parents of university students and members of organizations opposed to SAITM and privatization of education continue to occupy the temporary shed and engage in the ‘Harthal’ campaign. Political leaders too have gathered at the site. 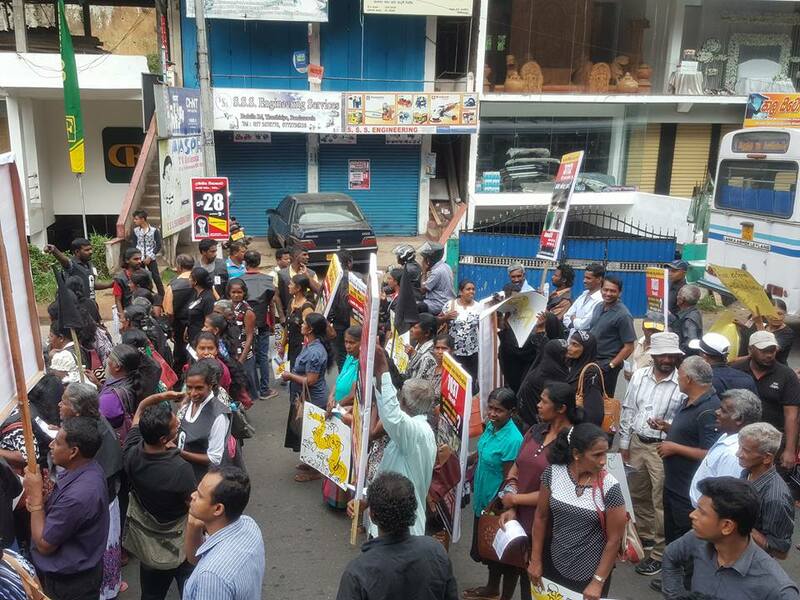 Collective of Parents of Medical Faculty Students against SAITM, the illegal medical degree selling institute at Malabe, continuous opposite Fort Railway Station. Colombo Fort Magistrate Ms. Lanka Jayaratna has issued an order to remove the temporary shed put up by the Collective of Parents of Medical Faculty Students opposite Colombo Fort Railway Station to carry out a ‘Sathyagraha’ campaign being carried out to demand the government to abolish SAITM, the illegal medical degree selling institute at Malabe and to protest against the brutal police attack on university students who visited the Minister y of Health on the 21st to discuss their grievances. 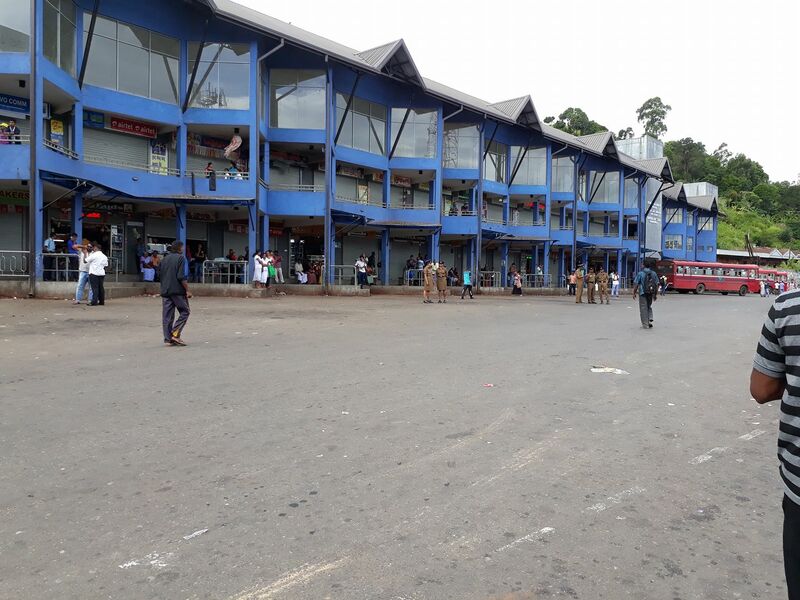 The Magistrate issued the order considering the police request stating that temporary shed put up by parents of university students was an obstruction to commuters. 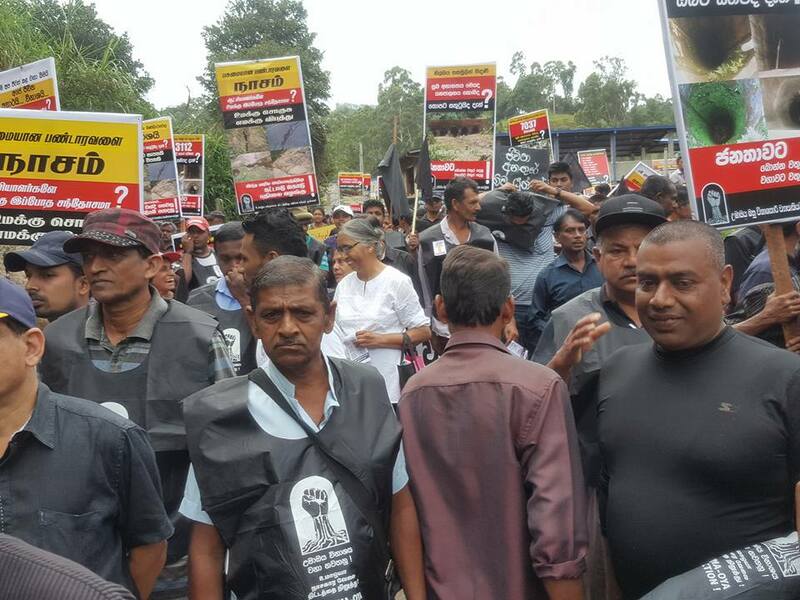 The President has agreed to have a discussion with the People’s Front against Uma Oya multi-destructive project while the ‘Black Harthal’ was continuing in Bandrawela town against the Uma Oya multi-destructive project and to demand the government to declare Bandarawela area a disaster zone yesterday (28th). Accordingly, the discussion will be held tomorrow (30th) at 6.00 p.m. 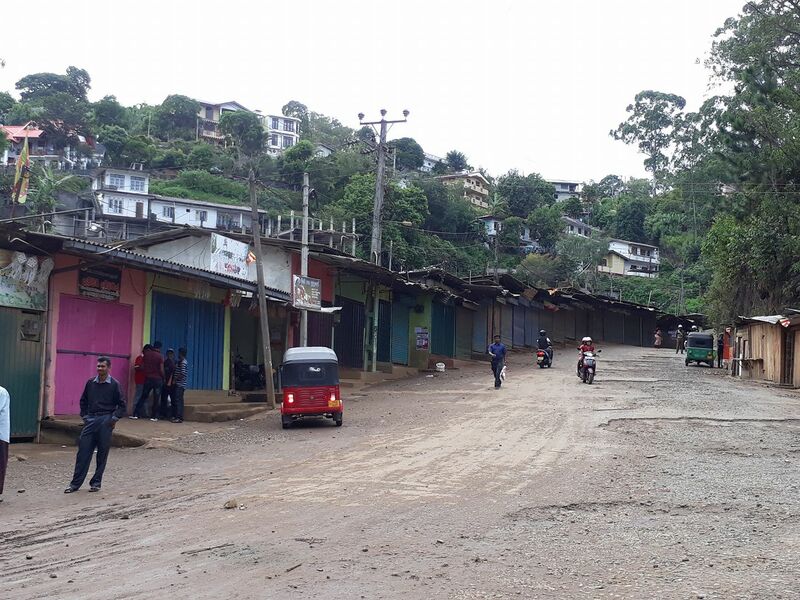 The letter from the Presidential Secretariat had been handed over to the People’s Front against Uma Oya multi-destructive project through the Secretary to the Provincial Governor and the Bandarawela Divisional Secretary. 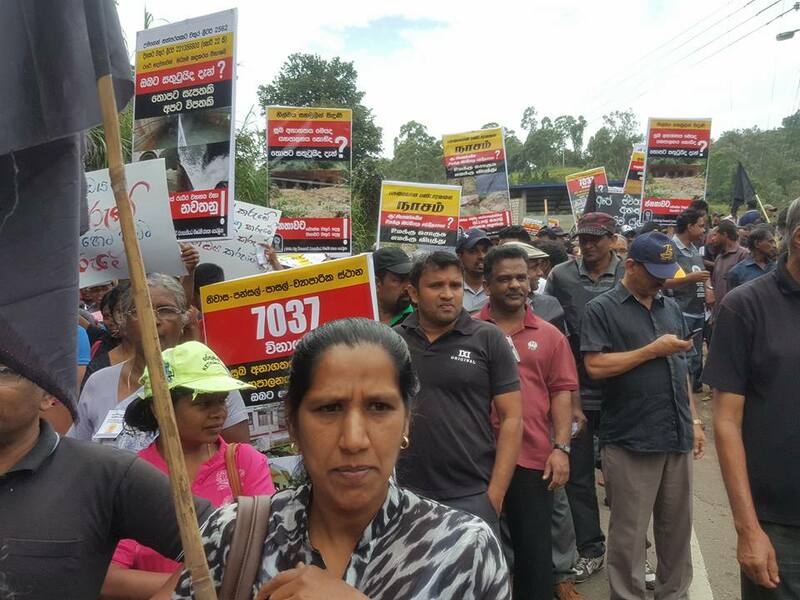 After the Secretary to the Governor read the contents of the letter to the people over the public address system the letter was accepted with the agreement of the protestors said the convener of the People’s Front against Uma Oya multi-destructive project JVP Provincial Councilor Samantha Vidyarathna. 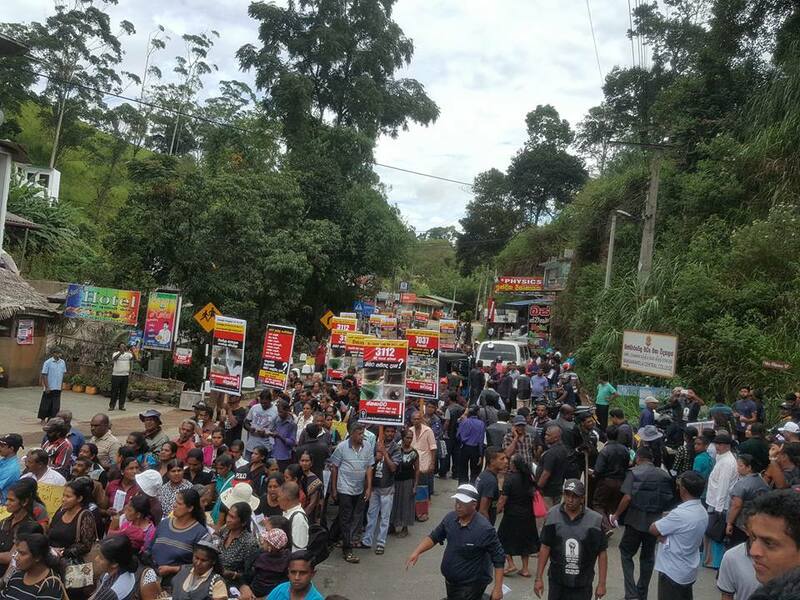 The rally being held simultaneous with the ‘Black Harthal’ campaign to protest against Uma Oya multi-destructive project and to demand the government to declare Bandarawela area a disaster zone has been participated by a massive crowd. 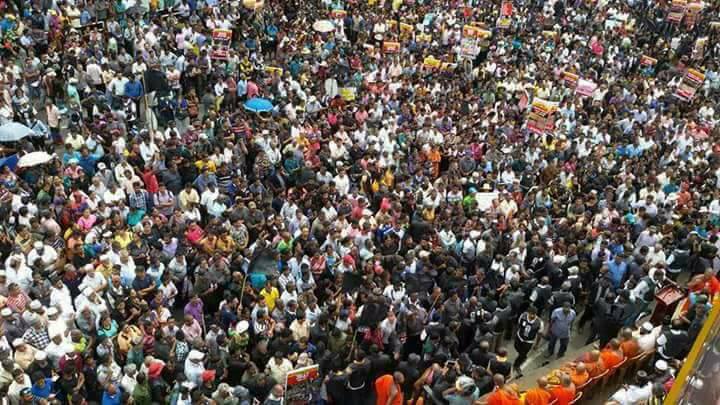 The convener of People’s Front against Uma Oya multi-destructive project JVP Provincial Councillor Samantha Vidyarathna is addressing the rally. 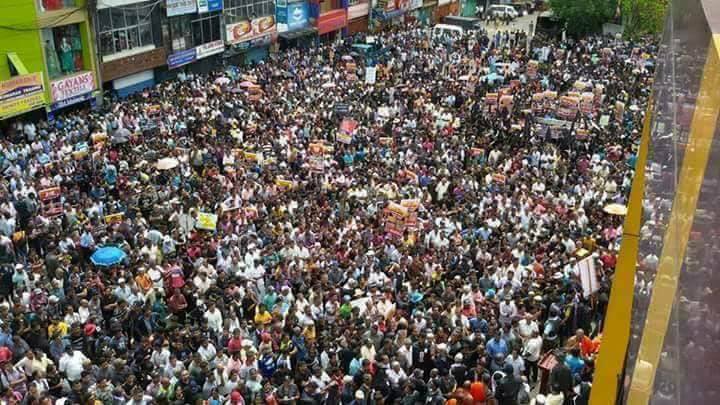 The ‘Black Harthal’ organized by the People’s Front against Uma Oya multi-destructive project demanding the government to declare Bandrawela area that is subjected to a massive destruction due to Uma-Oya project and other grievances will be held today sys the convener of the Front JVP Provincial Councillor Samantha Vidyaratna. 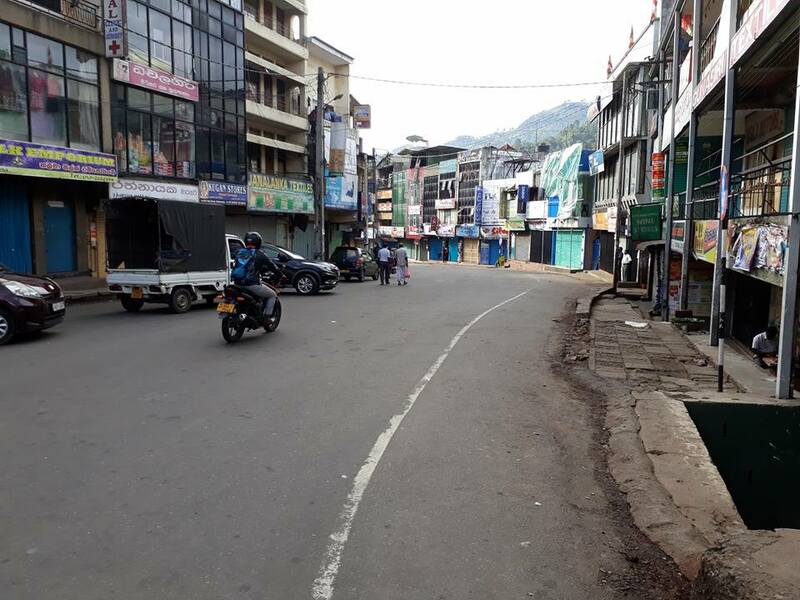 Already all shops and boutiques except for the hotels have been closed down and black flags have been hoisted all over the area. 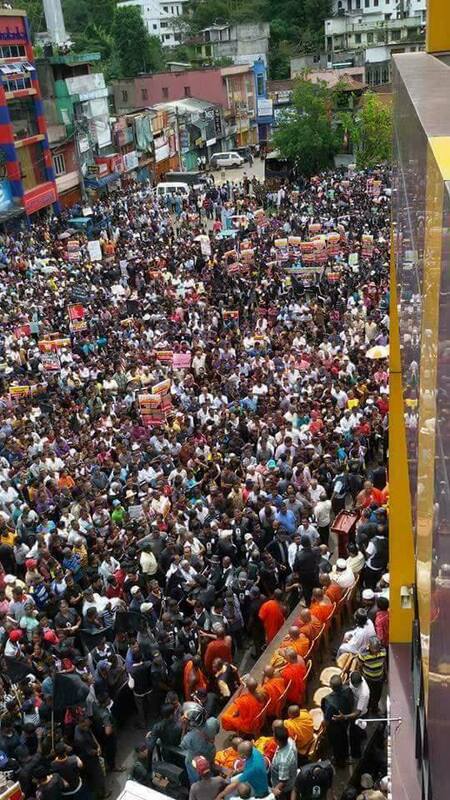 Transport has come to a standstill and school children have kept away from attending school. 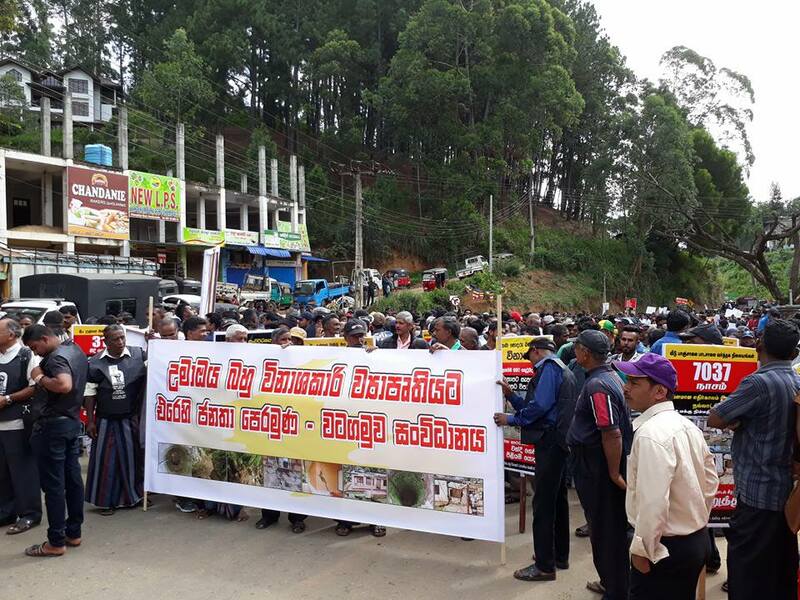 Two demonstrations commencing from two different areas will converge at Bandarawela town. 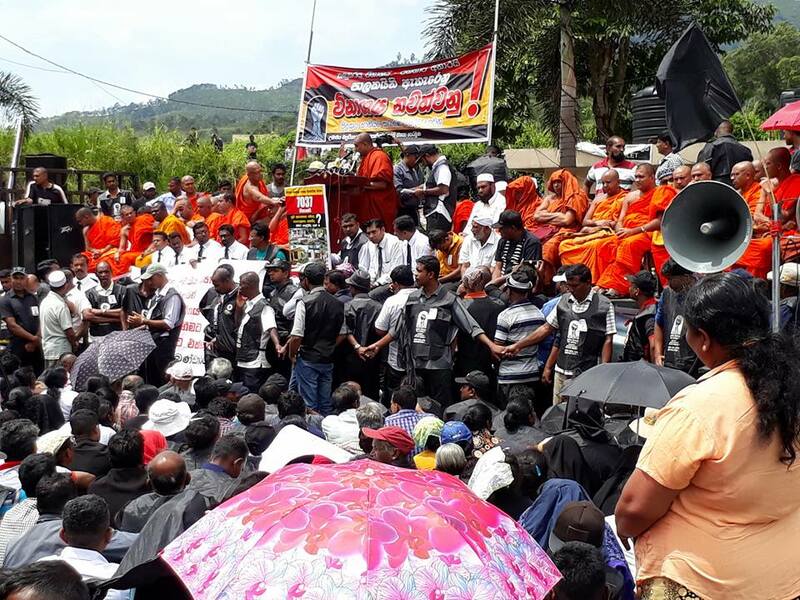 The Maha Sangha in the area, residents, environmentalists, lawyers, employees of school transport services, Bandarawela Trades’ associations, patriots, intellectuals have arrived at the places where demonstrations will begin said Mr. Vidyaratna. The announcement released by the Secretary to the President would not be amended and there was no discussion between the President or any representative from the Presidential Secretariat on the 26th states the Secretary to the President P.B. Abeykone in an announcement. Media had reported that an emergency discussion was being held between the President’s Secretary on the 26th. However, President’s Secretary emphasizes that there was no such discussion. 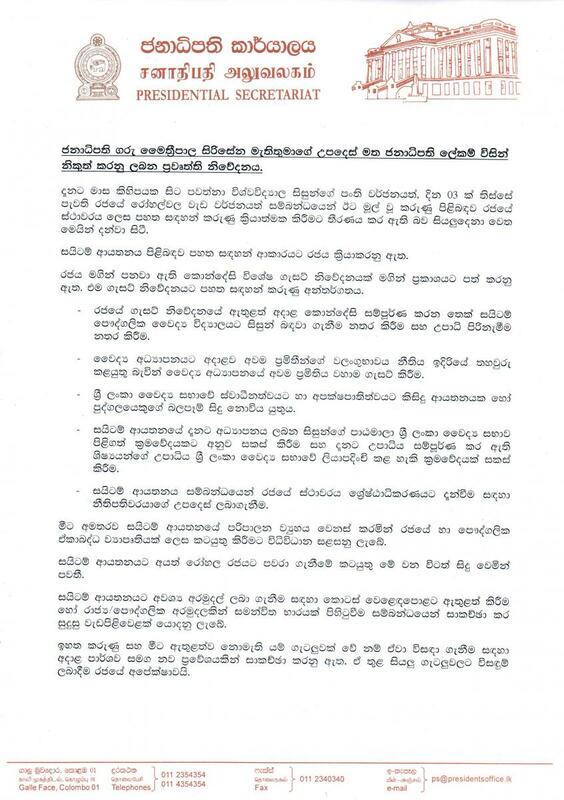 The stand of the President in connection with the emergency discussion held between the President and the GMOA on the 24th on the SAITM illegal medical degree selling institute was announced in a document yesterday (25th). According to the document released with the signature of President’s Secretary P.B. 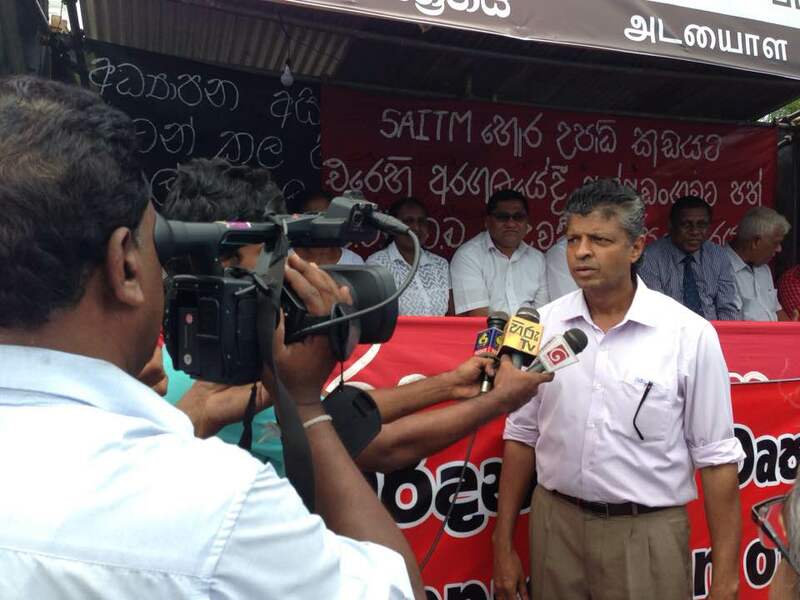 Abeykone illegally setup SAITM would bet government recognition and it has been decided to maintain it as a Public – Private Joint Venture. 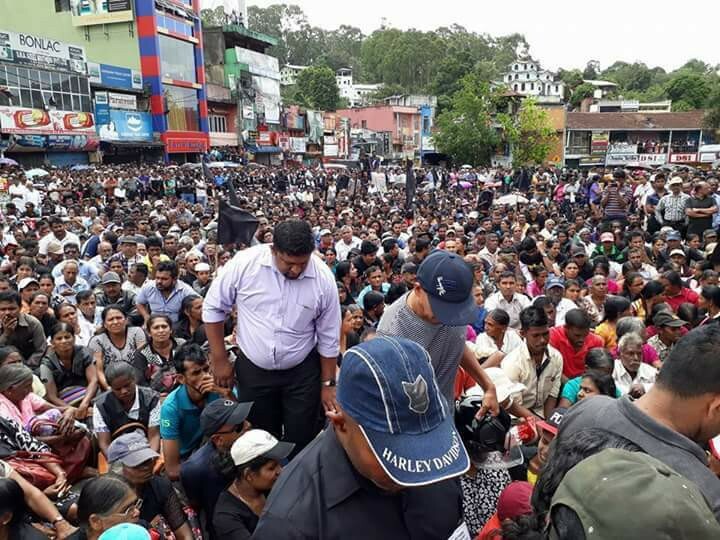 University students, trade unions, political parties and civil organizations are carrying out a massive struggle demanding the government to abolish SAITM. 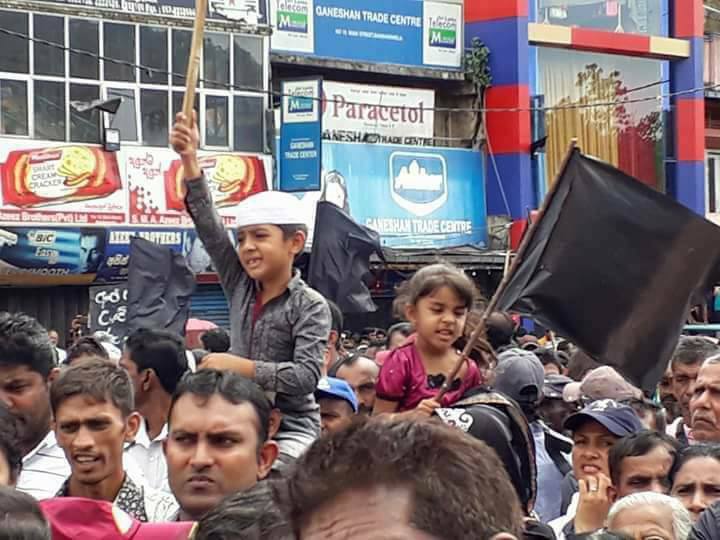 The GMOA that carried out a continuous strike protesting against the brutal police attack on students who went to the Ministry of Health seeking a discussion with the Minister and demanding the government to abolish SAITM had a discussion with the President and abandoned the strike action stating the President responded positively. This announcement was released after the GMAO had the discussion with the President. Let Ramazan be a strength to link with other communities to make our society one ‘whole Nation’. The JVP extends its warmest greetings to all Islam devotees in Sri Lanka as well as those around the world who celebrate Ramazan today (26th). Today marks the completion of the holy Ramazan month through which Muslim devotees observed fasting. During this period they help their brethren who lead difficult lives. The qualities of brotherhood, temperateness and generosity that are prominent during Ramazan period are specially valued as they are qualities that are fast disappearing in this capitalist social system. Dawning Ramazan at a time communalism and religious extremism are attempting to raise their ugly heads is important to our society. The period of fasting and Ramazan festival that gives prominence to distribution of resources equally is especially important. We believe that its message is important not only for Muslim devotees but also for the rest of the population. We believe Ramazan would be a strength to keep away from the mire of communalism and religious extremism, identify provocations and link with other communities to make our society one ‘whole Nation’. 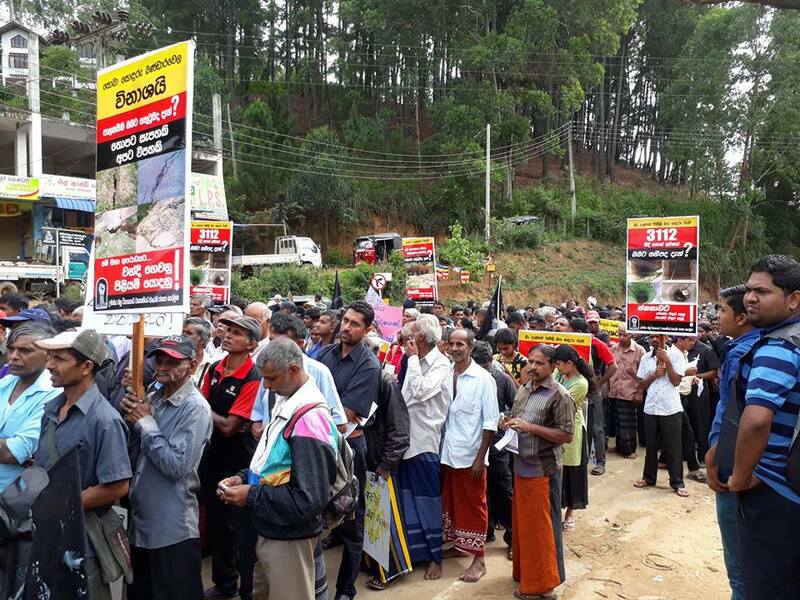 The first of a series of meetings to make the people aware of the ‘Black Harthal’ movement to be held to demand the government to give relief to people who have been affected due to the ‘multi-destructive Uma-Oya project, halt any future destruction and restore the destructed environmental system was held at Purukdegama in Hali-Ela area yesterday (24th). 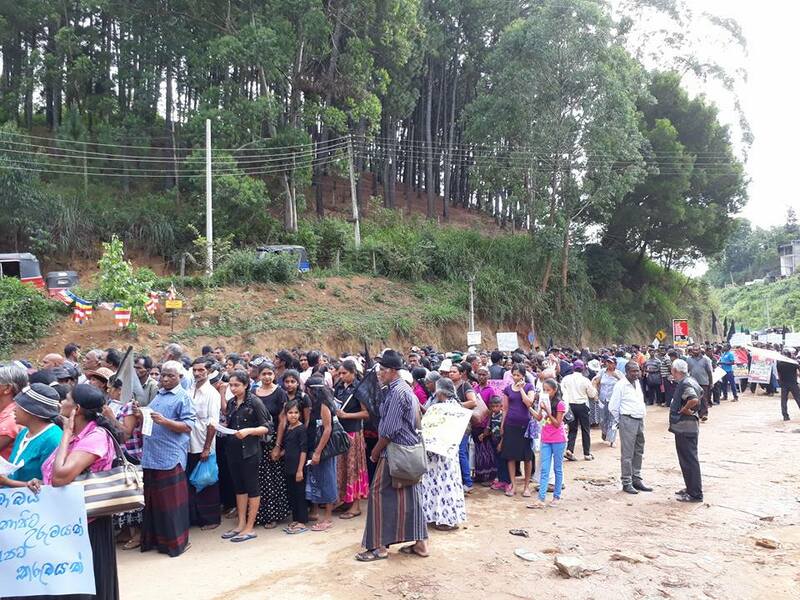 More than 15,000 villagers participated and all of them said they would join the ‘Harathal’ with all family members. Mr. Vidyarathna said mass organizations, various associations, environmental organizations in the country, intellectuals have expressed their desire to participate in the ‘Black Harthal.